After a hasty getaway from the Salton Sea we drove a few more miles and reached the eastern end of the vast lake and the final town we would drive through before reaching Salvation Mountain. As we pulled through the town we saw it was surrounded by massive power plants and power lines strewn around like cobwebs in an old attic, businesses and houses were just as deserted as the other small towns we ran through earlier in the day. The further we got the less building we were seeing, as they tapered off completely the roads became surrounded by piles of broken glass shimmering in the mid day sun, abandoned concrete structures coated in vibrant graffiti and cryptic messages were now the only thing resembling structures and life we saw. Miles into the distant desert as far as the eye could see were old camper vans on blocks with slapped together tent huts around them, “do people really live out here” we both murmured. Surely one couldn't survive out here for long, as we came up on one of the martian huts we saw a weather torn man sitting in a lawn chair in worse shape then him, he gave a slight nod as we drove past as if to answer or previous question. Cresting a small hill on the dirt road we traveled one could see a large mound in the distance, not like the sand covered ones we had been seeing for miles, this one was special for ever a few miles out the radiant colors it had been painted with glowed in the distance like a mirage from the movies. We sped up to make our way to it as if it was going to disappear before we could reach it, the parking lot was small and the van kicked up a dust storm as we pulled in and parked off to the side, the once small colored mound had grown quickly as we approached now towering over our van as we left the vehicle. 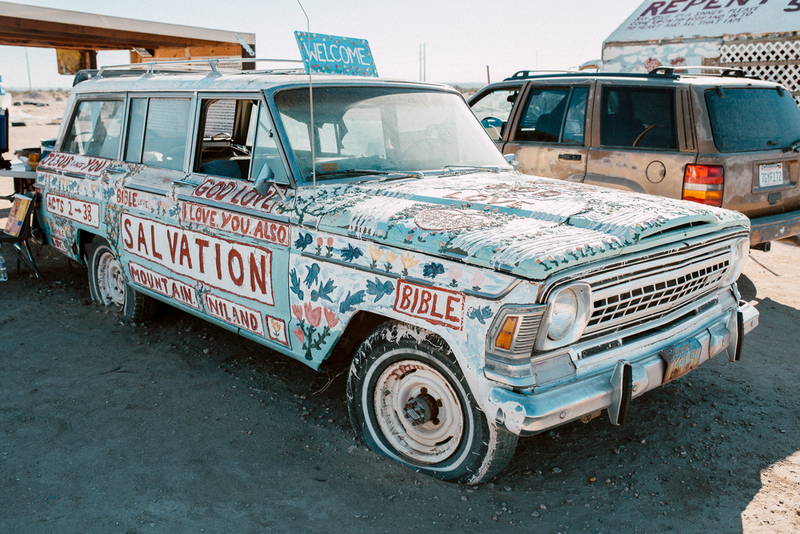 “ Welcome to Salvation Mountain ” a friendly voice chimed from a few yards away, we glanced to where the voice had came and saw an older women sitting pleasantly in a shaded hut next to an old car hand painted with life lessons. She told us how this place was special to her for more then just obvious reasons,. That back home, which surprisingly was very close to our home, she could no longer walk due to issues involving her back but once she got out here to Salton Sea that she hasn't had a day of pain since! This was further proven by her climbing and painting the side of the mountain all day.After continuing finishing up our conversation with the pleasant lady we began exploring the most odd of places, starting with a “cave” on the far right entirely made by hand using only what was available which from the looks of it was adobe, branches, and old car parts, once inside you felt as though you just jumped into a child Dr. Suess book. Strange colors lined the walls in sporadic patterns, makeshift portholes formed with circular shards of glass molded into the wall sides, these let in beams of multi color light that danced around the open room. The air inside and out was clean and dry, we passed through a dimly lit corridor and ended up in a room filled with belongings of fellow visiter's, everything from photos to drivers licenses lined the walls, a penance for the extraordinary place they just experienced. On top of the mountain you could see the desert stretch miles until meeting mountains, we made our way down said our goodbyes to the kind women, took one last look back at the brightly colored peak and hopped into the van and off to our next adventure.